When I shuffled up for the event, I was still running Mystic Enforcer in the sideboard. I have replaced those with Cold-eyed Selkie. I did make the swap of Fulminator Mage for Surrak Dragonclaw prior to leaving the house, as I expected to possibly see Scapeshift, Tron or Bloom sometime during the night, so I wanted to hedge my bets. I finished a respectable 3-1 on the night, and in 4th place. My only loss was to Merfolk, which prompted the inclusion of the Cold-eyed Selkie, since Lord of Atlantis is frequently dropped. So, I might as well get a buff and some Islandwalk on my own, draw some more cards, and see what happens. It is also a nice combo with Rafiq of the Many, netting double cards and double damage. I had an interesting conversation with a friend about my choice, and it was discussed if it was worth it to "handicap" myself against top decks just to have longer, more interactive games against newer players. Personally, I think it is worth it to build interest and to give instruction to newer players. Plus, being at a disadvantage against the top decks, and picking up some losses, seems to put me right where I want to be, in helping out newer players. Of course, immediately after having this conversation, I beat a well-tuned Scapeshift deck that just won a local PPTQ not two weeks earlier. So what do I know? Regardless, while underpowered somewhat, the deck was a blast, and it can be a lot of fun when people are reading your cards and trying to figure out what you are doing next. I think my opponents enjoyed playing against me, win or lose. 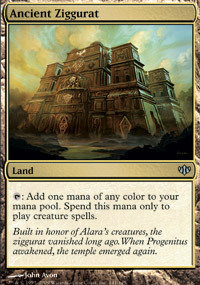 It got me thinking, though, Modern is virtually limitless in the various decks you can play. Sure, looking through the MTGO daily results, you see a lot of the same decks over and over, you do occasionally run across a few gems that are low cost, and different than the usual grind. I've searched through the lists from the last week, and found a couple I really liked. With the reprinting of Goblin Piledriver, people are going to be all over various Goblin decks in Standard and Modern. While this may not be the ideal home for the Protection from Blue beater, this deck has a couple things working for it in the positive. For the budget conscious, this deck is extremely inexpensive to build and play, with Goblin Guide being the only card that is somewhat costly, at least in paper. It's still going for a mere 6.5 tickets on MTGO, so might as well grab them now, before the post-Origins MTGO Release hits and the price jumps. The two Mutavault are cheaper, per card, than Goblin Guide, but, if you can only really buy/trade for one of them in paper, get the hasty goblin. Worst case, you can replace Mutavaults with Ghitu Encampment. This deck has the ability to be extremely fast and can come out like gangbusters, while overwhelming your opponent. Backed up with four Goblin Grenade and three Shrapnel Blast, a solid 35 points of cheap direct damage, you even have game in case of a ground stall. For my purposes, this deck may be too fast to take to an FNM, but I would highly encourage a newer player to pick up the cards and play it, and I wouldn't hesitate to play in online. Good old Skred Red. I got crushed by a version of this deck in the Top 8 of Nebraska States back in 2007. That deck would go on to take down the entire thing, and earn the pilot the coveted State Champ title, back in the days when that kinda, sorta, maybe meant something, and there weren't almost double digit annual State Champions. I got my revenge, albeit almost 8 years later, by beating another version during the opening rounds of GP: Omaha this year. Obviously, in 8 years, things changed significantly between the original Standard deck, and the one I played against in Omaha. Obviously, this is less of a budget deck than the previous deck I highlighted. Both Blood Moon and Magus of the Moon are ridiculous right now, regardless of your medium of choice. They are important for this deck, and can significantly slow down and effect a lot of Modern decks, giving you time to set up. On top of that, you do NEED to run the Snow lands, so you will be shelling out about a dollar to a dollar and a half per land. Sure, it seems like a lot when they are just basic Mountains, but the Snow-ness is required. At the end of the day, 20-30 dollars/tickets for your Mountains, plus another 10-12 for your Scrying Sheets is a bargain for most Modern mana bases. And, outside of those costs, the rest of the deck is, again, really inexpensive. 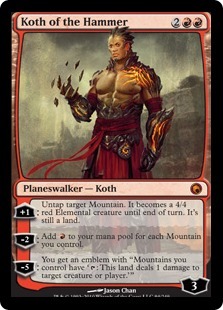 Even Koth is not bad and is a completely affordable Planeswalker. At its heart, this is a control deck. It burns things and blows things up until it gets to a formidable threat out and takes over the game. If you have the Blood Moons already, go ahead and build this and play them. 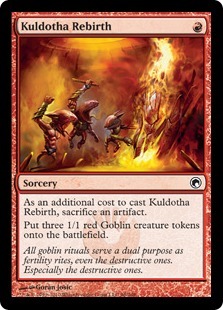 If you don't have them, and don't want to drop the money right now for them, it is reasonable to replace the Blood Moon with Molten Rain and even swap the Magus of the Moon with Goblin Ruinblaster, and just run a main deck land destruction game. I'm not sure exactly how effective it will be, but it is reasonable. And who knows, maybe you could also run Deus of Calamity in place of the Demigod of Revenge as a beater/additional LD option. This is a pet deck that I've been playing around with in the TPR. Other that AEther Vial in paper, which is still experiencing a significant price spike, nothing in the deck it too absurd cost wise. I have intentionally avoided Verdant Catacombs, Cavern of Souls, and Twilight Mire for cost reasons, and there are other areas you can skimp on if necessary, such as Duress in place of the sideboard Thoughtseize. If you happen to already have those cards, by all means, feel free to upgrade to some of those options if you desire. Also, while Company Elves could be considered either a top tier deck, or just below the upper echelon, I did not want to build a Company deck. I am well aware that that deck exists, and I did make the conscious decision to not mirror that list. When I built this deck, I imagined an Elf version of Merfolk. Sadly, Elves have Lords that cost three, as opposed to the standard two that Merfolk get. But that didn't stop me, and I even went out of my way to track down and get copies of Lush Growth and Nylea's Presence to test in the Spreading Seas slot. While I ended up abandoning that idea, possibly way too soon, I did go with a few more interactive spells in their place. As I play this, there are times I really feel that I may be better off cutting the two swords from the deck for a couple more elves. I could see adding in another Elvish Champion, and I'm not above considering Dwynen, Gilt-Leaf Daen when it is available online. There may also be a place in this deck for Dwynen's Elite, and I wouldn't be adverse to adding them in place of main deck Inquisition of Kozilek, moving them either to the sideboard, or just removing that effect entirely. I do like a lot of the interaction that I get from the Black splash, so I am hesitant to remove it entirely. Right now, the deck plays only OK. I would like to get it clicking along better, and I'm hoping that, possibly, with a handful of Origins additions, this will be ready for prime time...or at least FNM. I'm having a lot of fun with Magic, and especially Modern, currently. There are so many options and so many choices. While I would hold it against no one for playing the Top Tier decks, sometimes, there's a lot of joy and a great deal of satisfaction simply getting off the beaten path and trying something different.